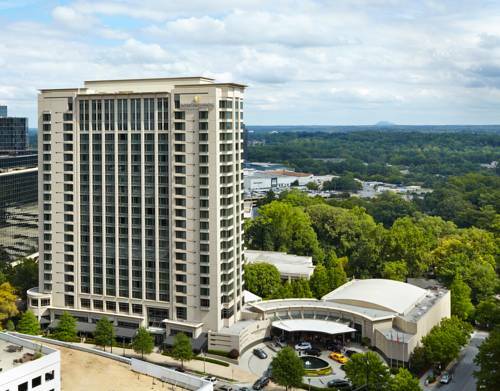 InterContinental Buckhead Atlanta offers sophisticated business and leisure travelers a host of quality facilities. Southern hospitality is assured in our unique event spaces, including two opulent ballrooms and the breathtaking Windsor Garden. Prepare for a night out with a range of all-natural treatments at SPA InterContinental. Let award-winning chef Art Smith astonish you at the hotel's exquisite Southern Art restaurant, followed by a nightcap of fine whiskey at Bourbon Bar. Windsor Ballroom is our largest meeting space and the largest ballroom in Buckhead. It has 4500 sq. ft of pre-function space adjacent to it which opens onto the Windsor Garden. The room is conveniently located on the ground floor. Adjacent to the Windsor Ballroom, the Windsor Pre-function opens out into the Windsor Garden. This 6,100 square foot room features Venetian glass chandeliers and glass doors that open onto the Windsor Garden. Trippe is conveniently located on the ground floor, just steps from the Windsor Ballroom and across the hall from the Hope meeting room. Hope is located on the ground floor across from the Trippr room and around the corner from the Windsor Ballroom. Hope looks out onto the Windsor Garden. This pre-function area serves the Hope and Trippe meeting rooms. The Windsor Garden is a 25,000 square feet area for outdoor events. The Willard Boardroom has a permanent boardroom set up that can accomodate groups up to 14 people. The Barclay Boardroom has a permanent boardroom set up that can accomodate groups up to 14 people. Children's program - The InterContinental Buckhead Atlanta is only minutes from Atlanta's Georgia Aquarium, which is located next to Centennial Olympic Park and the World of Coca Cola, and a short walk from Phillips Arena, Georgia Dome and the CNN Center. Southeast's premier shopping destination. Anchor retail includes: Macy's, Bloomingdale's & Nieman Marcus as well as Apple and Ralph Lauren. The South has spoken and the word is Phipps Plaza is among the best of the South! Phipps Plaza - named a "Southern Best" in Southern Living magazine's Readers' Choice Awards - is anchored by Nordstrom, Belk, and Saks Fifth Avenue. This Buckhead men's boutique offers made to measure suits, sports coats and trousers...oh, and there's a bar in the back and the brothers are grilling out back every weekend in the summer. This lady's boutique is located about three blocks from the InterContinental Buckhead and provides one of a kind styles, for a sensible budget. With limited quantities, hop on these haute offers while the getting is good. MARTA is the rapid transit system for Atlanta and is located just a few blocks from the hotel. North Fulton Golf Course features 18 holes and is located at Chastain Park. Take in the classic thrills of Six Flags Over Georgia. Just 40 minutes south of InterContinental Buckhead Atlanta, a visit to this world class theme park is the perfect half-day 'release'. Spend an afternoon gallery-hopping. From abstract sculpture to contemporary painting to glass blowing, you're sure to uncover the perfect prize at any one of the gallery districts of Atlanta. A leisurely drive through West Paces Ferry Road (and its offshoot streets) reveals how the upper crust lives. Among many other high-profile occupants, the Governor's Mansion may be viewed on the right as you head west. If you can make the time. Take a walking tour of Atlanta's historic neighborhoods to see the Fox Theatre, Historic Downtown district, Grant Park, and Margaret Mitchell's Ansley Park. Visit the Presidential Library and Museum of Georgia's only Commander in Chief - Jimmy Carter. One of only 13 Presidential Libraries in the US, it contains a replica of the Oval Office and memorabilia from his presidency. Take a run through the urban landscape of downtown Buckland: it's the perfect five-mile jogger's loop. Tip: Allow some time to linger out back in the Quarry Gardens. With the recent addition of the Centennial Olympic Games Museum, the History Center has become a must do. Check out the Permanent Folk Art and Civil War exhibits. Tip: Book early, as this popular tour fills up fast and reservations on the day are not accepted. Taking you into the heart of the CNN operation, this tour provides a great first hand view of producing and broadcasting headline news. Tip: Contact the Concierge or www.georgiaaquarium.org for advance tickets as blackout days times are frequent. Five hundred species of global sealife and five million gallons of water fill the largest aquarium on the face of the planet. Embrace a bird s eye view of this 30 acre horticultural haven while perched atop the newly completed Canopy Walk . Adjacent to Atlanta s own Piedmont Park, these gardens also house the largest permanent collection of orchids in the U.S.